Halloween. Day of the Dead. Samhain. All Souls Eve. All Saints Day. These are but some of the names by which the Cross Quarter, the days haf way between the Autumnal Equinox and the Winter Solstice, are known. They are the last days of October and the first days of November. Technically the Cross Quarter is the moment when the Sun reaches 15 degrees of Scorpio. This year that occurs on November 6th-7th. Do you notice how all the designations of this time period refer to the Dead in some manner? There is a reason for the attention to the Dead at this time of year. At the time of the November Cross Quarter the Spirits of those we have known and love are able to, for but a brief time, revisit us here in the Earthly Domain. Regardless of their relationship to you they are regarded as Ancestor Spirits. Many cultures have developed their unique expressions to acknowledge the Ancestors who are moving about. In the Day of the Dead ceremonies a person will place the favorite item of the loved one upon an altar dedicated to the ancestors. It might be a drink of alcohol, a plate of food, a cigarette or a cup of coffee. Incense is burned, smells being enjoyed by the Spirits. I have even seen, of late, iPods playing the departed person’s favorite music! Greet the Spirit of your departed loved one. Even if you feel self-conscious about this, unsure about all this, give it a try. Build an Ancestors altar. It could be made of a nice piece of cloth on a table top, set with a candle, a dish of candies and your loved one’s photo and their favorite treat. Maybe even write a note to your loved one telling them how much you miss them, or telling them of the new grandchild. Spend some time in meditation and contemplation there at the altar. Be in silence. Listen. Feel. Laugh and cry with them when you feel their warm and comfortable presence arrive. Experience the love. Greet your Ancestor Spirits! There are also, however, those Spirits who have been unable to cross over that are inexorably pulled back here into the Earthly Domain at this time of year. Mythically it is held that at the time of the Winter Solstice the Gateway of Return is open for a brief time, allowing the Spirits of those who have died in the last year or before – but for whatever reason were unable to make it across immediately following their death – to move across to the Other Side. The Winter Solstice is halfway between the Cross Quarters of November (generally held as being November 2nd) and the February Cross Quarter (generally held as being February 2nd). When a Spirit has had physical embodiment it must exit from the physical realm. Imagine that the bridge which carries the Spirits back across is anchored on the Other Side and here in the Earthly Domain. So the Spirits must set foot upon the bridge, at the Winter Solstice, from here, the Earth side. As the Earth-Bound Spirits begin to move through our worldly domain they are felt by us, discerned in a manner of perception that is akin to the awareness we have in the dream state – at the edge of awareness, sensed with feelings, a glimpse of a shadow that does not belong where we saw it. If we have a sensitive nature, or are easily impacted by the thoughts and feelings of others around us, we may even have direct interaction with these visitors. For the most part, remember, the Spirits are just visiting. Still, there are those Spirits that refuse to give up their attachment to the Earthly Realm. They utilize this window of opening to come into the world and seek out those who might have a similar fixation as their own. The fixation might be one of drug or alcohol abuse, emotional indulgences, trauma or someone who is ungrounded and not participating in the fullest experience of life. When the Earth-Bound Spirit finds someone in this recognizable state of dissonance or ungrounded sensitivity-without-boundaries, the Spirit begins to match frequency with the disaffected person. This enables the Earth-Bound Spirit to attach itself to the unfortunate and generally unwilling victim. When a person has this type of entity attachment they will begin to feel out-of-sorts, filled with thoughts, emotions and cravings which cannot be identified as being one’s own. Behavioral changes will ensue as the entity inserts itself more and more into the person’s field in an attempt to recreate its own dysfunctional experience of life. The purpose of carving scary faces in pumpkins (turnips were originally carved back in the Celtic lands) is to drive away the Earth-Bound Spirits that begin to roam at the time of Halloween. As these Spirits are coming from the Under-World (the realm of dream), when they see the frightening countenances of the pumpkins lit from within they see them from the perspective of the dream – that is, they see them as actual monsters and flee from them! What is now-a-days called the Holiday Blues is a phenomenon that predates the modern confluence of winter holidays extending from Thanksgiving through Christmas and New Years. It is, classically, a time of greater incidences of depression, anxiety, manic behavior and suicidal tendencies. Then, mysteriously, these symptoms seem to dissipate around the time of Groundhog Day… February 2nd, the next Cross Quarter, celebrated as the Time-of-Lighting-New-Fires. Shamanically we understand that just as the opening at the November Cross Quarter draws the Earth-Bound Spirits into the world, so does the solarizing influence that comes to the fore in February repel the Spirits, pushing them back into the Under-World. The portal closes and all is well once again. With the opening of the portal at this November Cross-Quarter on through Winter Solstice and until the February 2nd Cross Quarter the Spirits from the Under-World, the Land of the Dead are more apt to roam amongst us. If you are a person who is sensitive to otherly influences, or susceptible to moodiness and swings of emotions, you are most vulnerable to the invasive attachment of these Earth-Bound Spirits. It is for you, any any who reading this may feel the beneficial need for assistance, that I offer, free of any request of fee, the following Protection Symbol. This symbol is one of many that are held in sacred trust – in this, the lineage of my Caretakership – on behalf of the People. Please utilize it in the manner described. The Protection Symbol, when activated, resonates a frequency that makes the person and their home and family inaccessible to Earth-Bound Spirits. I describe it as being like teflon to those entities. The frequency generated also ‘spins’ the entity back to either the Under-World or, if they do not resist, to the Other Side (into the Light, as you might call it). To activate this Protection Symbol, first drag-and-drop the image to your desktop, then print it. The small symbol (my logo/signature) should be in the lower right corner. Hold the image about 18 inches from your eyes. Let your eyes de-focus. then… BLINK!! This will imprint the symbol within your field. As the symbol is a resonator, it will continue to resonate its frequency into your field for as long as you wish. You may, of course, at any time remove it from your field by repeating the process while holding the intent of its deactivation. 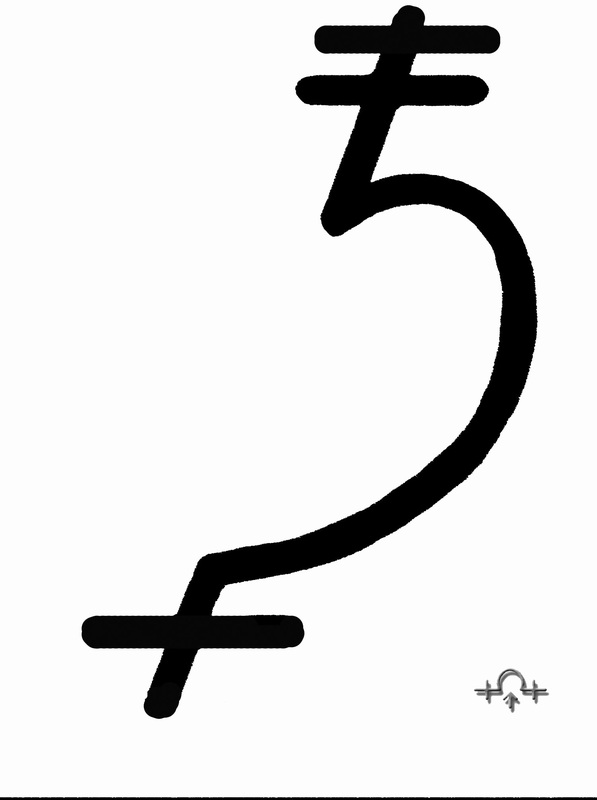 You may then also post this Protection Symbol in any area of your home that feels awkwardly cold or uncomfortable, these being indicators of the presence of an Earth-Bound entity. I find it especially helpful to hang one of these above a child’s bed, just as a matter of course. The symbol, in and of itself, will do nothing on its own. It must be activated and it must include my own logo/signature. Kinda like a username and password. Both are required.